The 52,617-acre East Fork High Rock Canyon Wilderness is in the northern Calico Mountains, bordering the High Rock Canyon Wilderness to the south and west. This is an area of volcanic uplands cut by the drainages of the East Fork of High Rock Canyon and by High Rock Canyon itself. The canyons vary between 200 and 500 feet deep, eroded through yellow, brown, red, orange and gray layers of volcanic rock. Elevations in the wilderness vary between 4,900' and 6,600'. Other than one small stand of aspen and some willows, the vegetation consists mainly of sagebrush. The canyons are somewhat better watered here and support riparian areas and meadow complexes. The wildlife consists of pronghorn antelope, mule deer, California bighorn sheep, mountain lion, coyote and sage grouse. A lot of raptors find the canyon walls ideal for nesting purposes. The Applegate-Lassen Emigrant Trail passed just west of here and you can still find the remains of old homesteads from those days in the East Fork High Rock Canyon Wilderness. There are also several archaeological sites in the wilderness with artifacts present that date back thousands of years. East Fork High Rock Canyon Wilderness is part of the Black Rock Desert-High Rock Canyon Emigrant Trails National Conservation Area. 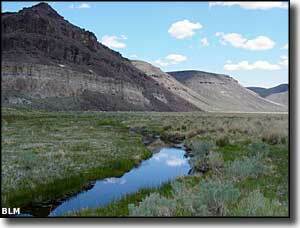 Photos of High Rock Canyon Wilderness and Applegate-Lassen Trail is courtesy of the Bureau of Land Management.